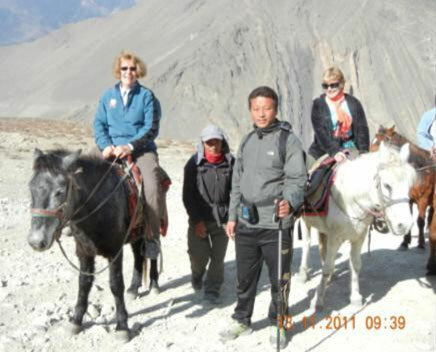 Last Trek Report – TREK REPORT - MUKTINATH 2011 - Trekking in Nepal with Teresa, Slow Trekking for peoples of all ages. Diane arrived from Perth a week early in order to volunteer at Bright Future Community Centre in Kapan. 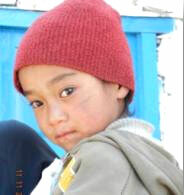 She quickly hooked up with Ian and Kay who had ‘stayed on’ after the Langtang Trek to do similar work for a few weeks. They seemed to be having a lot of fun with the kids and Ian’s knowledge of computers and electronics is going a long way at the Dreamland Computer School. Good on ya! 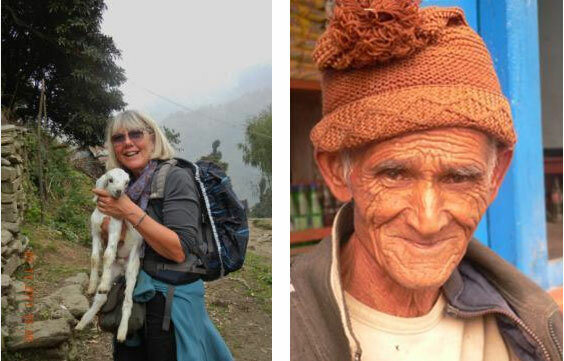 I collected Marilyn and Ewa while many of our Langtang trekkers were still in Kathmandu. We walked over to Bouda for a stroll around the old stupa. It was full on Tihar which was very atmospheric but the service at the Kitchen Garden was monumentally slow; almost enough to put some slightly jet-lagged members to sleep. I took them to the domestic terminal for a flight to Chitwan early next morning. ‘An experience’ was their verdict, though the Chitwan trip was memorable. I heard a harrowing tale about an elephant taking off into the river with Ewa clinging to its back while someone tried to rescue Marilyn from drowning – quite unnecessarily. Too much fun! OCTOBER 27: Rita joined us from the U.S. Rita was the woman who had to cancel her Langtang Trek last month so it’s terrific that she was able to make it for this one. In the entire 55-day trekking season this was my one day off. Luckily, Rita didn’t arrive till 10 pm. By the time I picked up Marilyn and Ewa from Chitwan on 28th, Helen from Melbourne, who had done this trek before, along with Roslyn and Denise from WA, had all settled in at Muna Cottage. Along with Rita and Diane we had our posse. Over to Bouda for dinner again. Tihar celebrations continuing. Fairy lights all over the stupa, fireworks going off overhead. Dinner at Heavenly View was just that. Dancing in the streets on the way home. NOVEMBER 30 was huge. We did banking, trek-shopping and bought loads of interesting things at Amrita Craft. I love this huge warehouse (supposedly wholesale) where everything has a price tag – such a novelty in Kathmandu. We had started the day with new passport photos – no need to use those dreary ‘biometric’ ones for your souvenir trekking permit. This only took ten minutes but Denise had already bought a gorgeous dress before the pictures were printed! We had a huge lunch at the Weizen and then went for a long amble through the old bazaars of Indra Chowk and Assan Thole – so much more diverting than the tawdry tourist tat in Thamel. We picked up prayer flags in Tahiti Thole on the way back. This area specialises in Buddhist wares. One can buy really long ropes of sturdy, hemmed, colourfast prayer flags, well-printed with pictures of Green Tara or Guru Rimpoche as well as the more conventional Wind horse. We took our dinner in the garden at Muna Cottage. Simple food, well-prepared in good company on a warm evening. We were joined by Ian and Kay, Isabel and Cathy and even Liz flew back from Pokhara on Yeti Airlines. Early night with loads of packing still to do. NOVEMBER 31: Breakfast in the garden. Cash, plastic bags full, hauled out of the safe, then a bit of a wait for our very own bus. The lovely, new Toyota minibus was well worth the wait. Our first stop for a wee in the bush was not entirely successful but I will spare you the gory details. Not much later we were settled around a table in the garden at The Hamlet with a nice cup of tea and our cinnamon Danishes bought at the Weizen yesterday. The toilets have been upgraded and fully-tiled – a huge improvement. The scenery was breathtaking. Our lunch stop was selected by the driver. It was way too late and not that flash – though the ice lollies were excellent. An hour and a half later, at just 3 pm, we were unloading our gear at the Lake Diamond in Pokhara. Mankumar and Sanu were so pleased to see us. Single rooms all round were a big hit. After tea and coffee on the terrace it began to pour with unseasonal rain. As I write this I have arranged to meet downstairs to dash to the main road for pizza. Can’t keep seven hungry women waiting. NOVEMBER 1: It was disappointingly cloudy at sunrise so we didn’t rush our breakfast on the terrace. Lahar and Sundance came over just after 7 and took Ros, Denise, Marilyn, Ewa and Rita out across the lake for a short trek up to the Peace Stupa. Nobody struggled too much with the walk though it was a warm, humid morning. Good to hit the trail, however briefly, after all that preparation. I did a bit of organising and shopped for a pair of ‘dagging around the lodge’ pants. I’d somehow forgotten to pack my trusty old black ones (thanks Helen W. – I am still wearing them). I found something vaguely suitable and a big, loose, ‘Om’ shirt which I’ve already found useful. Helen and I had breakfast at Cafe Olive. It was so good I decided to bring the group back here for lunch. The food was fantastic. I had the Mediterranean Plate – huge mounds of homemade hummus and baba ganoush with warm pita bread. There was a fair bit of shopping done in the afternoon. A lovely silver chain and ‘Om’ pendant for Denise’ partner. At four pm we held our pre-trek briefing though the sky was trying to rain the whole time. At 5.30 the guys showed up. 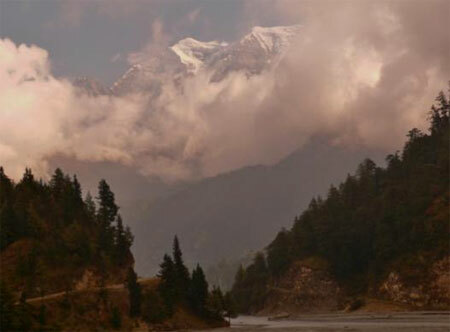 This season we have Lahar as guide, with Prem, A.G. (And Gyeltsin Sherpa), Dhanraj (Dorje’s older brother), Bir (kind of Dorje’s uncle), Sunder (Sundance) (Lahar’s brother-in-law), Ram (Lahar’s younger brother), Kaji (the music man) and Tham (Kaji’s ‘village brother’ and recently married). We took Sonam (Lahar’s neighbour) as our runner. Ten staff in all and eight ‘bideshi’. Quite a posse. Sanu did us proud for dinner. Chicken momos and a full daal bhat. I actually ate too greedily and had to have a little lie down. Final packing and an early night. NOVEMBER 2: We teamed up the porters with their customers while waiting for our bus to show up. None of the packs was seriously heavy, except mine – half a million rupees in 500s. The bus was a huge old rattletrap but gaily decorated inside and out. We were soon clattering along the worn out bitumen road. I checked that Lahar had the permits. ‘Yep’ straight-faced came the reply. I didn’t think anything of it when he was on the phone shortly afterward. Didn’t think anything of it when he asked the driver to slow down near his house to ‘waive to his kids’. Then there was Loyan (Lahar’s wife) running towards the bus – permits in hand. Nice one Lahar! It only took a little over an hour to drive to Nyapul but we couldn’t make it without a pee stop – one too many coffees this morning? A beautiful, CLEAN field was selected; however, it was so narrow there was no option but to just drop our daks in unison in a long row. Great visual image. Lahar’s little sister was selling friendship bracelets at the start of the trek so of course we bought heaps. And then we were off! In just 40 minutes we were sipping tea at our first lodge with a terrace overlooking a gully full of bamboo and cicadas. It was solidly uphill from then on. Sadly, a new jeep road (as yet unused and already crumbling) has scarred the landscape and trashed the lovely old path. Soon the old path reappeared and we left the new track behind. Kaji is going to return after trekking to scout the far bank for an alternative path for next season. We lunched at Sudame but the beautiful old garden was gone. The road again! I realise that locals benefit from road access in so many ways but it seems a shame to spoil the trail that attracts so many visitors. Hopefully ACAP (the park authority) will keep their promise to develop and maintain alternative trekking trails once the road is open to vehicles. After lunch the trekking was delightful on old stone stairs that wind through rice terraces where ‘ketibhati’, rice harvesting, was in full swing. Some harvested fields were being ploughed with traditional ploughs pulled by oxen. 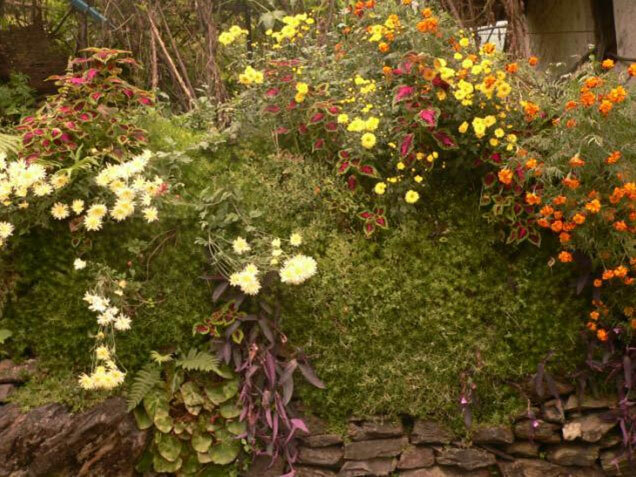 The weather was overcast but mild and the soft light made the marigolds, geraniums, bougainvillea and pea-flowers fluoresce intensely. The houses and lodges were almost entirely of whitewashed stone with blue paintwork and sympathetic plantings – very picturesque. We easily made Tikedungha by 4 pm where most of the customers made a beeline for the hot showers. We shared a few rum and cokes before dinner in the little wooden balcony that hangs over a gully full of giant Bambu and the sound of raging waterfalls somewhere in the darkness far below. NOVEMBER 3: It rained for most of the night. With overcast weather an early start was not so critical. Today’s physical challenge was hard. At least two pigs. It is not such a long day but we did climb 3,350 stone stairs. That is a lot! We all managed OK but had slowed to a crawl (almost literally) by the lunchbreak which was mercifully early at 11.30. I resolved to try a different teahouse for lunch next year as our regular spot has become rather grotty. We passed a spotlessly clean place just a few minutes after lunch, called Kamala. More stone stairs after lunch but only for an hour and a half. The heavy mists cleared a bit as we neared our lodge, revealing neat veggie gardens of cauli, cabbage, radish, beans, potatoes and spinach in between small crops of millet. As I write this the customers are all ensconced in the new wing of the lodge with attached bathrooms – some of which are more functional than others. I have my favourite old corner room with a window looking out over the trail. I can see smoke billowing out of the chimney which means the stove is lit in the dining room. Hot chocolate anyone? The guys brought their guitar, drums and flute into the dining room after dinner and showed us how to cut loose Nepali style. NOVEMBER 4: Today was absolute heaven. Deep, dark, mossy forest of mainly rhododendrons with ancient gnarled roots. Their tortured, pale pink trunks playing host to a myriad epiphytes. Being autumn the trees were draped in russet-coloured ferns and an amazing variety of emerald mosses. Fast flowing streams of crystal clear water criss-cross the trail and vines of chestnut-coloured leaves arch over the earthen track. There were long flat stretches in between the climbs (wish we had a few more of those in the Langtang). It was almost sunny at the lunch stop but the warm stove drew folks inside. When we reached Gorepani at 3 pm it was really cold and beginning to rain. The stove was already lit in the dining room of the enormous Sunny Lodge and Ros and Denise found a very drinkable bottle of Chilean red. The lodge was packed to the rafters and the single rooms, at the back, downstairs, were rather dingy affairs. We were given very thick quilts at bedtime. The moon shone brightly in a clear sky – bodes well for tomorrow. NOVEMBER 5: Well, the sky WAS clear when I went outside for a look at 5 am. The sky was lightening at 5.40 when I woke the rest of the crew. Unfortunately, all we could see were clouds. It was a huge climb up to Pun Hill. 400 metres of vertical. It took about an hour. Over our shoulder, each time we stopped for a breather, was a rather hazy but lovely view of Anapurna South and Barasikhar. I had a glimpse of Nilgiri south but it was fleeting. We must have passed 200 people coming down but by the time I made it to the top only our own group was left there. For some bizarre reason we did the Hokie Pokie and then thundered quickly back down the steep track to a really great breakfast. We set off at about 10 am. It was easy going downhill though the knees started to complain about the time we stopped for morning tea at Chitre. There was a little spit of rain so we had another cup of tea and waited for it to pass. Our wet-weather gear turned out to be unnecessary. My knees were sore by the time we stopped for lunch at Serendipity but by then we only had half an hour to go. The garden at Serendipity was a lovely spot for lunch and the fresh pumpkin soup was excellent. Today’s trekking was really pretty with lots of whitewashed cottages with slate roofs and well-kept gardens. We saw roses, fuchsias, lilliams and, of course, thousands of bright orange marigolds which were often used as companion plants in the veggie gardens. The cute stone-walled village of Sikha has drawn the customers outside for a stroll as I write this in fading light. The stove has been lit in the dining room so I am off. NOVEMBER 6: It was cloudy again this morning so no view of Daulaghiri but it is certainly much warmer down here. The sun broke through as the day wore on and it became warmer and warmer as we descended another 800 metres. Helen and I were soon lagging way behind as we stopped to talk to locals, play with baby goats and photograph the locals going about their work. We had morning tea with Umesh, his tiny tea-chop still clinging tenaciously to the hillside as the new road winds around it. We bought some oranges at Gara and caught up with our pals at Durbin Danda for a snack lunch of cheese, crackers, fruit and cold cokes. I liked it. The jeep road reaches right up to Gara now but there is almost no traffic on it as it is impassable in many places with half a metre of rutted mud. We did see a tractor loaded with goods and people and I think I heard a jeep. 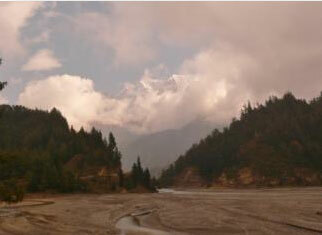 The final descent to the Kali Gandaki is through a pretty little village and then a long spiral staircase of a track. Locals were stringing a flower garland across the river at the big bridge. It is at least a hundred metres. I stopped for a smoke and was soon sharing with several delightful old ladies. There was a lot more action on the road into Tatopani. Motorbikes, jeeps, small busses. A bunch of unruly oxen had us ducking for cover on the inside edge as a truck beeped furiously approaching fast from uphill. Tatopani was a haven. The road goes around the bottom of the hill. Our garden was a delightful place to take lunch. Chips, salad, beers. Now I remember why we stay here for two nights. The hot springs were sensational. Floating in hot water was just what the doctor ordered. In the evening we strolled about the large village checking out the shops. Ros and Denise found another bottle of red wine. Must be my turn tomorrow. NOVEMBER 7: Not much to say about today except that we all really enjoyed it. Diane was the only taker for a walk to the waterfall. The sun shone all day. Clothes and hair were washed, books were read. I found a bottle of Jacobs Creek Cabernet Shiraz. All good stuff. 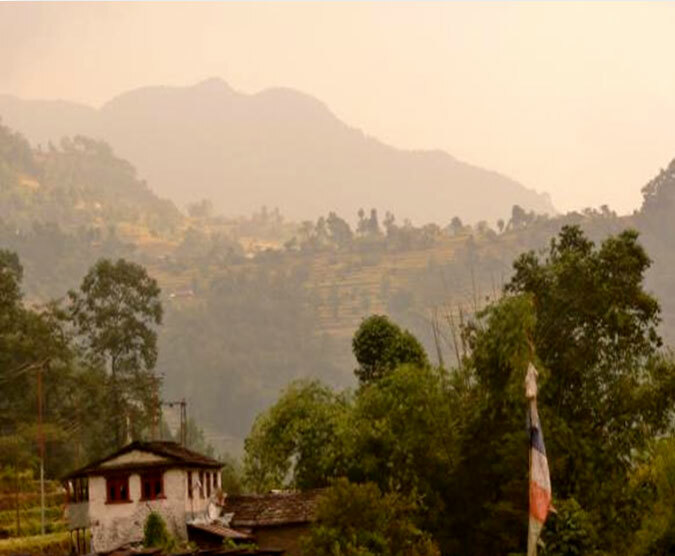 Best thing about today - the beautiful spectacle of Nilgiri South – the weather has broken! NOVEMBER 8: Today was really, really hard. Half the group, consisting of Ros, Denise, Ewa and Diane (go Diane!) opted to take the harder trail off the road before lunch. The ‘smart team’, as we called ourselves, went via Dana and Rupse Chahara. We did spend a fair bit of time trekking on the road but there was very little traffic. At Dana we left the road for a long stretch through a village of old salt trader’s houses. We lunched at the Rupse Lodge under the big old, sadly ailing, apple tree. We spotted the ‘A Team’ across the valley and a loud coo-ee got a response. The waterfall at Rupse was going full bore after the recent rains but the road bridge over the spillway was broken and a passing jeep had to practically drive under the falls. It didn’t take long after that to cross the big suspension bridge and find the A Team eating lunch at a rather dreary teahouse in Kopchepani. This village has always had a rather grubby, unkempt feel to it and their lunch lived up to low expectations. The climb up to Pairotapolo was arduous but only took an hour (a bit of a record I think). At the top Rita bought a pretty little basket from a local craftsman. One more cup of tea and we were on our way for the last leg. (Well, we thought so at the time). 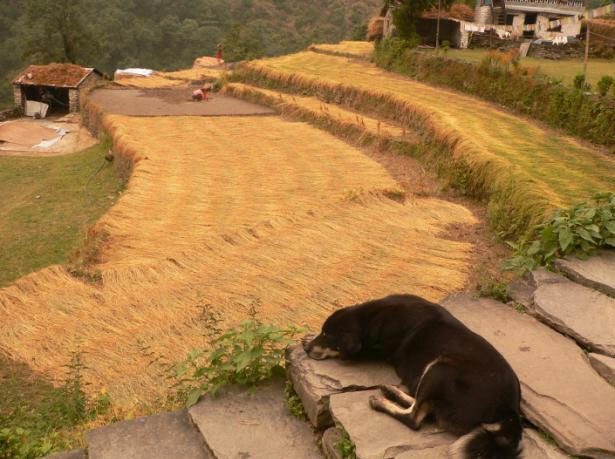 Our lovely companion dog, which had waited for us at every corner of the trail all afternoon, was at home in the teahouse and helped us finish off the biscuits. Helen and I flagged badly at the jeep station in Kalopani and had to stop for one more cuppa – at a really disgusting little hovel where the tea was surprisingly good. It was all we could do to refuse an offered lift on a passing tractor. It was almost dark when we staggered into the National Lodge but it turned out to be a real find. The rooms were cosy and really clean, the shower was hot and the food was excellent – especially the cheese toast and tomato soup. The hot table was a treat too. The moon rose from behind a nearby ridge illuminating a snowy peak and silhouetting the strange palms which grown high up here. Looking forward to getting a picture of that from Rita. The hot table was very cosy tonight with dancing afterwards. A bunch of dull Swiss (what else?) resisted our efforts to get them to join in though their Nepali guide had a good voice and soon joined the dancing. I just had a look at the sky, still cloudless at 9.15 pm. The peaks were all glowing in the moonlight – I’ve never seen them look better. NOVEMBER 10: We got up early on a perfectly clear morning to see the sunrise in a cloudless sky. It was really, really cold. Kaji soon warmed us up with exercises in the courtyard before breakfast and we set off in weak sunshine wearing our warm jackets. In forty minutes we were huddled in the warm kitchen at Kokethanti for morning tea. From there we took a wide loop around a bend on the east bank of the river through a delightfully easy pine forest trail with soft, sweet-smelling pine needles underfoot. Daulaghiri and the Ice Fall towered behind us as we emerged from the forest into the wide open river bed. We dawdled across the river looking for interesting rocks and fossils. We used the seasonal bridges to cross the various streams of the Kali Gandaki which by now was about 1.5 kilometres wide. We saw a stunning avalanche on the way. Lunch at Larjung was rosti with fried egg on top. Not usually one of my favourites but really tasty today. (Lots of onion and garlic in the potatoes?) We shared Mars and Snickers rolls for desert but it was too gooey and sweet even for a confirmed chocoholic like me. As we traipsed over the pebbles and sandbars of the river bed to Tukche we had a very strong wind at our backs. I am always pleased to be back here with Uma and Samar. Their house is over 200 years old; thoughtfully renovated and immaculately clean. As I write this it is nearly 5 pm. The sun has just dipped behind the nearby ridge sending the temperature plummeting. The customers are all in the ‘solar room’ on the roof. Glad I got my hair dry early. I am in my favourite corner room in the old part of the house with carved windows overhanging the street. I could live here. NOVEMBER 11: Today was a wonderful day. We started with a visit to the distillery but it was a bit early (before breakfast) to be tasting brandy – especially brandy this bad. We then walked through the oldest part of the village to the gomba. A puja (prayer ceremony) was underway. About 10 monks were alternately chanting and playing traditional Tibetan clarinets, clashing cymbals and huge drums. The whole place resonated with the loud, magical sound as we removed our shoes and sat at the back on cushions. Not sure about everyone else but I was completely transported by the hypnotic rhythm. A handsome monk served us sweet tea. A touching experience that will stay with me. After a big breakfast where we took the second opportunity to sample the ‘bewdiful’ stewed apples, we set off on another sunny morning. It was almost hot on the road but within half an hour we had crossed the bridge and were walking along the pine and juniper-shaded trail to Chairo. Past apple orchards and a few farmhouses the only traffic was a group of French trekkers and a few cows. At the Tibetan refugee camp we had a cup of tea and then ran the gauntlet of handicraft vendors. We all managed to find something special. Helen’s mala, a kind of Buddhist rosary, made of yak bone beads inlaid with turquoise and coral was a real find. The wind was really howling as we trudged the dusty road into Marpha but inside the village all was quiet. The narrow lanes, snugged into the hillside, protect the village from the winds that rage most afternoons here. We ate our veggie soup and huge plates of chips sitting in ornate upholstered armchairs – oddly out of place in these rustic surroundings. The wind was blowing a gale as we left Marpha. Soon there were no more trees just low brown scrub as far as the eye could see into an immense valley with endless ridges of brown hills leading to the massive ramparts of snow-capped Nilgiri. We stopped by Mangal’s house where his sister Sumitra made us tea. Always nice to visit with the locals. I had planned to take the whole gang to Upper Shyang but when I came outside they were already away up the track and I couldn’t call them back in the howling wind. So Helen and I, always last, headed up the steep track to this rustic village that almost nobody visits. I visited Samperi to see how Ishneha was doing and was pleased to learn that she was just arrived home from the Daulaghiri Boarding School in Jomsom for the weekend. I was stunned at the change in this little five year old girl who is being sponsored by Howard’s family (from last year’s trek). She is about two inches taller and leapt into my arms for a long hug. Can’t believe the change for the better. The Marco Polo was a welcome sight, bustling with activity as Adil’s parents were visiting from America. His Dad proved really interesting company. NOVEMBER 12: It was an easy walk to Kagbeni on a sunny day. We made it to Kagbeni in time for lunch with a brief stop for a cup of tea at Eklai Bhatti. We ate the tough little Kagbeni Bread rolls washed down with the freshest of apple juice in the warm dining room while the wind howled outside. After lunch we braved the wind to walk up to Thiri in Upper Mustang. This previously ‘forbidden kingdom’ is open up to the first village and is well worth the effort. We climbed up the gully to see the walled-in meditation caves; we peeped over the walls of the water ‘tanki’ with its ancient pines, dark against the sand-coloured landscape. The main street, if you can call it that, was full of tiny cows and donkeys being chased by grubby kids with sticks. 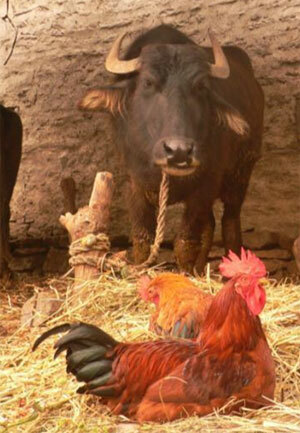 At Pema’s house an entire yak had been chopped up and hung to dry in the rafters. 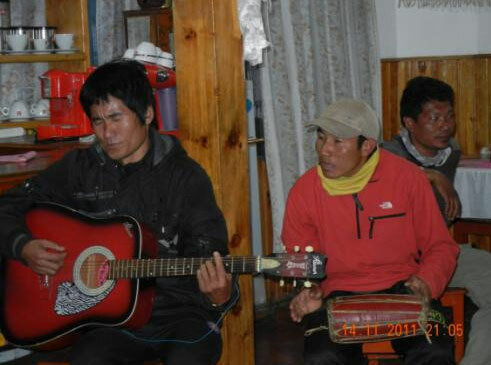 Pema’s dad entertained the guests. It was really, really windy on the return walk but the sun shone and the clouds scudding by cast enormous shadows on the vast, windswept brown ridges. Love the view of Kagbeni from this side of the Kali Gandaki with Muktinath and the Thorong La in the background. We nearly went to bed early tonight but the sound of banging and crashing drew us outside. We found the local lama bedecked in glittering robes along with all the monks in strange garb and ugly papier- mache masks dancing in the streets while crashing cymbals and blowing trumpets. It is an ancient ceremony to chase away bad luck at the end of the millet harvest. Lots of fun. NOVEMBER 13: Our ponies waited patiently in the courtyard while we lingered over our Kagbeni Bread with Yak Cheese for breakfast. The ride up was fantastic. I myself struggled a bit with the short stirrups less than ideal for a ‘dodgy hip’. Even our first-time riders seemed at ease. I got down at the first rest stop and set off on foot but before too long a motorbike gave me a lift – which was a lot scarier than the horses! After tea at the Blue Sheep (not sure what that didi puts in the tea but it is always delicious) we walked part of the way to Jarkot while the porters had a go on the ponies. Lahar didn’t stop grinning. We rode the horses up to the Mona Lisa lodge in Rani(bloody)Pawa for lunch in the intermittent sunshine. After lunch we walked up to the temples. First the Hindu temple with its jangling bells and 108 water- spouts. Then the very oldest gomba with its rather startled-looking Guru Rimpoche statue and ancient prayer wheel, worn smooth by many thousands of pilgrims’ hands. We continued uphill till we could see most of the trail from the Thorong La. We tried for a group hug but ended up doing the Hokie Pokie – AGAIN! With no male customers and the Nepali staff all being so spontaneous and unselfconscious we have had no trouble being quite silly at times. We ended our visit to Muktinath with a walk over to the Ani Gomba to see the flame and water in the rock. The flame was small but still burning – known to have been doing so for at least 2,000 years. Unfortunately (in my view) the Buddha statue here has been renovated and glassed in but still retains its sweet expression of limitless compassion. Descending to our lodgings at Jarkot was beautiful in the soft, late afternoon light. The hot table in the dining room was very warm, the food was excellent and we met some interesting new company – the Scots/New York people. We also caught up with Jenny and her son Tom from Lorne, the only people who seem to have out ‘slowtrekked’ us. NOVEMBER 14: Ewa was champing at the bit before we had even finished breakfast so she set off first with Dhanraj, closely followed by Marilyn and Diane. After a walk around the old village of Jarkot and a look inside the 500-year-old gomba, the rest of us took the descent back to Kagbeni at our own pace. We had lunch in the incredibly warm dining room at the Asia Lodge. This room is a real sun trap. We spent the afternoon washing dust out of our clothes and hair in a plentiful supply of solar hot water. The boys really cut loose tonight and the dining room was full of laughter, music, dancing and good cheer. They will leave us tomorrow so this is our ‘wrap party’ though we will be reunited in Pokhara. 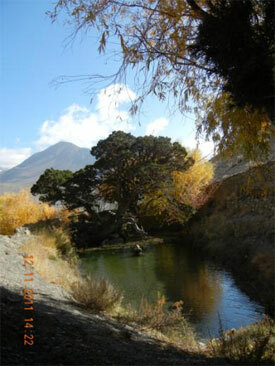 NOVEMBER 15: It was a rather cool morning when we set off for Jomsom. Ros, Helen and I wanted to walk but everyone else opted for another pony ride. I heard from another trekker later that they looked like ‘the magnificent seven’ as they rode down the valley. We were back at the Marco Polo for lunch, practising positive visualisation of blue skies for tomorrow’s flight. The porters ate an enormous daal bhat while I did the wages then we saw them off on the bus with one last Hokie Pokie. Lahar took Denise and me over to Thiri on a blustery but wildly beautiful afternoon. 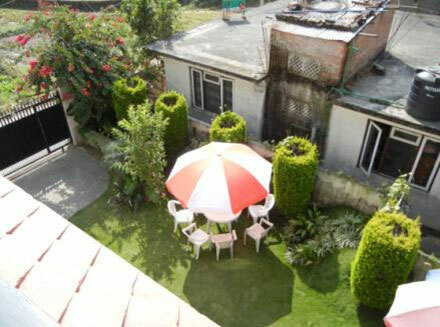 We found ourselves in a rustic old house sipping hot tea watching an old Hindi movie starring Amitabh Buchan – surreal. Back at the Marco Polo, we ate the delicious Kofta for dinner and then packed for an early take off. NOVEMBER 16: The morning skies were fairly clear over Jomsom but it looked very cloudy down the valley. I was far from optimistic as I scanned the weather on the internet – four days of rubbish. There were a few early fights but, as we were scheduled for the third flight of the morning, Yeti Airlines called it as they saw it. At 8 am our flight was officially cancelled. At least the early decision allowed us to get cracking finding a jeep – a feat which Lahar managed surprisingly easily. By 9 am we were motoring out of town. Marpha and Tukche were soon behind us but as we lurched across the river bed we hit one bump too many and broke the spring mounting on the right rear axle. We were promised another jeep in about an hour and a half. It was cold out there so we zipped up our jackets and walked, briskly, into Kalopani for lunch. It was actually a lovely walk with loads of sheep and goats being herded along the track. The veggie omelettes in chapattis at the Super View were first rate and our jeep arrived as promised. There were no further delays before Ghasa though the road was a bit thin at times and progress was very slow. At Ghasa there were no jeeps available but a rather large rattletrap of a bus, gaudily decorated inside, was mustered. Not the ideal vehicle for the challenging conditions but choices were limited. The lower reaches of the valley had been inundated during the previous week – a bit of a surprise to us as we had experienced blue skies and sunshine over the same week. Gigantic puddles filled the holes in the road and the edges of the road were missing in quite a few places. This was pretty scary as this road clings tenaciously to a cliff above the river for most of the way. The road only got worse towards Beni and we were all pretty sore in the ‘bottom end’ by the time we tumbled out of the bus. Our driver was brilliant and earned himself a very large tip. In fading light we found a minibus willing to take us into Pokhara. It was a much more comfortable vehicle, though I heard later that it was pretty bouncy in the back row. We bounced on and off the narrow strip of blacktop as we passed vehicles. Pedestrians were the biggest hazard in the dark. We made Pokhara by 9 pm– twelve hours on the road! Ewa and Ros were determined to have their promised Yak steak; Marilyn, Diane, Helen and I ate at Moondance; Denise and Rita crashed. Phew! NOVEMBER 17: Really easy day. Shopping, shopping and more shopping. Bedcovers, clothes and beautiful jewellery. Some of the group visited the mountaineering museum and found it interesting. We had a great dinner (24 people) at the wood-fired pizza place (never did know its name). All the customers, all the porters and Lahar’s family. So hard to say goodbye afterwards. NOVEMBER 18: Our experiences with transport over the past few days made us really appreciate the spanking new Toyota Hiace which showed up at 9,30 for the ride back to Kathmandu (thanks Deepak). We set off with Marilyn, Ewa, Rita, Helen, myself, Bir, Dhanraj and A.G. We also gave a lift to Tika and Akal. It was a perfect run. Lunch at Riverside Lodge and no delays at all. Meanwhile, Ros, Denise and Diane were driven down to Chitwan in their own car. (They will fly back to Kathmandu on 22 November). Netra and Isabel joined us for dinner at Muna Cottage – feels like home. NOVEMBER 19: Rita, Marilyn, Ewa and Helen joined me for a huge day out of shopping in Thamel today. 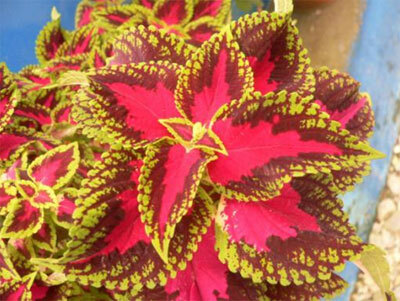 We went EVERYWHERE and bought beautiful things. Funky clothes, bags and souvenirs in Thamel. We taxied up to Swayambu to visit Bina’s little jewellery store. We walked down to the Vajra for a cuppa in the garden, stopping to photograph monkeys on the temple stairs on the way down. Another taxi (well 2 actually) crawled through peak-hour traffic across town to the Sherpa Mall in Durbar Marg for a visit to my favourite clothing store ‘Grace’ They sell upmarket traditional Nepali clothes and I think we all found something cool to wear. We ate at the Shambala with Isabel and Netra. Not that flash for a ‘last night’ but the food was tasty, the company was good and we were all completely tuckered out after a day of shopping – far harder than trekking. NOVEMBER 20: We awoke to clear blue sky and bright sunshine and sat in the garden over a slow breakfast until it was time for Ewa and Marilyn to go to the airport. Marilyn looked especially good in her groovy new Nepali gear. Helen and Rita were still there when I got back from the airport so we ordered another pot of coffee and a chow mien lunch. Netra called round for us to go and see the new solar panels on the computer school and a quick decko at the Ketiko Sewing School. Then Isabel took us cross country via Niru’s new house to Gokarna. It is a beautiful old Hindu temple, little visited by tourists. I liked the street life walking back to Bouda but it is a long way so we hopped on a local bus with very, very loud pop music. Bouda was thronging with the Tibetan community doing their ‘kora’ around the old stupa. We took our dinner at the Stupa View restaurant. Great pizza, good white wine, good company. Sometimes I just love my work. Rita departed on a late flight – only half an hour round trip to the airport. A record. Day off tomorrow. NOVEMBER 22: Found Diane, Ros and Denise at the domestic terminal around lunchtime. They’d had a wonderful time in Chitwan seeing elephant, deer, crocodiles, birds and a sloth bear. No tiger alas. I took them into town for yet another huge day of shopping. Ros and Denise stayed at the Hyatt – very, very posh. NOVEMBER 23: Helen and I took a fancy coffee ($15 for two) on the terrace of the Hyatt while we waited for Ros and Denise to come back from their visit to Bir’s house. They cut it a bit fine but we saw them safely into a taxi and headed for the nearby airport – off to Indonesia for a week of roughing it in Jogjakarta. Good luck. With farewells to Diane on a later flight (I heard later that she had a little trouble with her booking) our big trip was over. Luckily, I still had Helen and her newly-arrived mate Noelene for company. What a trek that was. Can’t remember a better one. Cheers folks, see you next time. Teresa.